Striker Ashley Barnes is “feeling his way back” into training with the first team squad. Barnes has been out with cruciate and medial knee ligament damage, suffered in the final game of last season at Aston Villa. But the 26-year-old could well make a return to action before the end of this campaign, as the Clarets look to bounce back to the Premier League at the first attempt. 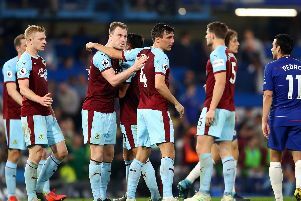 Barnes has eight goals in 58 appearances for Burnley since a £400,000 January move from Brighton in 2014 – including five in the top flight last term. Dyche currently has Andre Gray, Sam Vokes, Rouwen Hennings and Chris Long as his senior striking pool, but the quarter may have more competition on the horizon. Dyche said: “Barnesy is doing well. “He’s not close yet, he’s just on the borderline of soft sessions with us. “He might drop in as a floater or an end man in a little passing game. “He’s just beginning to feel his way back in. “He’s generally very fit because he’s worked very hard, but that last bit is coming in and working with the team, and operating with the team every day. Lukas Jutkiewicz also has an outside chance of returning before the end of the season, after also suffering a cruciate knee ligament injury in August. And Dyche recently admitted the pair’s progress was a factor in his January transfer dealing. He said: “Barnesy, in a true run of of progress, will get fit at some point this season, Juke unlikely, possible but improbable. “If Barnesy then came in fit, say you also go in in January, you could all of a sudden go from a thinner group to a swollen group of strikers.